Tri247's resident ' Jet Set Super Vet' Stuart Lumb is proud of his Yorkshire roots, and reports here on a local event he race, the Tadcaster Sprint Triathlon. 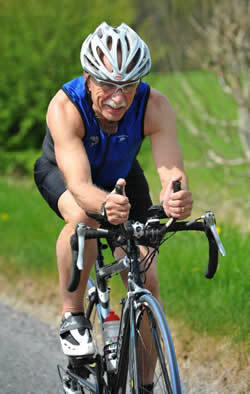 (Thanks to www.sportsunday.co.uk for the bike image below). Tadcaster is noted for being the site of several breweries, including John Smith's and Sam Smith's, although being a dedicated athlete I never touch a drop – well, not till after the race . It's also the venue for a comfortable pool-based event organised by 'Drinkie', aka Paul Drinkwater Sports Management (www.pdsportsmanagement.co.uk). I'd never done this event before but having missed Paul's Ampleforth Cross Triathlon event in April, I wanted to support his events and compete in one of his early season races and this one was ideal, taking place on Bank Holiday Monday May 6th. Entries have gradually increased over time and this year were nudging 400 and it was great to see so many athletes racing. I was delighted to see my start time was a civilised 10am which meant I didn't have to get up at the crack of dawn. 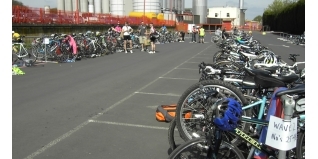 The temperature was approaching 20°c which suited me down to the ground, as I racked my bike... appropriately in a brewery car park! The 500m swim went ok plus it's always nice to be told when you have two laps left, as opposed to counting yourself - it's bad enough swimming without having to count as well... at my tender age anyway. T1 was quite a way from the pool so my trainers did a double stint that day. I was racing on my trusty Giant TCR Composite One, now 10 years old but despite that still a lovely bike to race on. The bike split was only 14km but the poor road surface and a sneaky hill kept me alert. Back into transition, off with my trusty Bell helmet funded by my sponsor Danisco and on with my nice Saucony Triumph trainers, also courtesy of Danisco (although the company now is actually owned by Du Pont of the USA). The 7km run followed the road for a while and then the course snaked along the banks of the River Wharfe. Running along it was great to see families out having picnics by the riverside. The Wharfe itself was quiet and smooth and with the sun beating down I thought to myself we should have been doing the swim split in the river. Having said that though, triathlon is not a cheap sport and of course pool based events give aspiring athletes the chance to dip their toes without forking out for a pricey wetsuit. 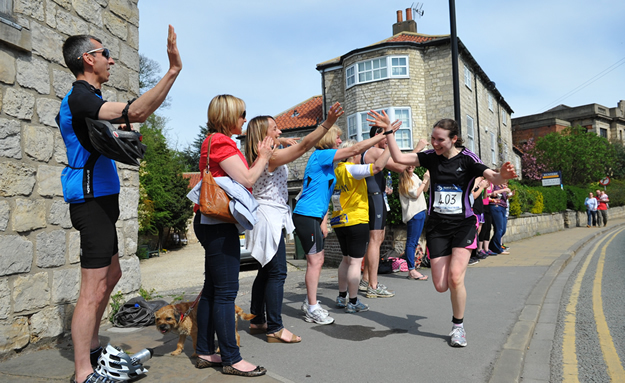 The last kilometre of the run involved running through the middle of Tadcaster to get to the finish and it was great to see so many people out lining the streets – a real carnival atmosphere for sure. Certainly a great day out and an excellent well organised event. Paul had the split rankings highlighted in the results which are invaluable in seeing where your strengths ( and weaknesses!) are. I was in the low three hundreds zone for my swim and run but ranked 231 on the bike. I just wish some of my bike prowess could be carried over to my running . Having said that because of my niggling heel injuries over the last two years my running has been minimal so am just grateful I can jog round the run split. My sister is a retired physiotherapist; when I ask her advice about my injuries I get short shrift as her reply is generally “well, what do you expect doing extreme sport at your time of life!" Stretch routines and ice packs are very important in terms of keeping me race fit, but I'm just glad I can do what I can do given I'm now a Vintage category athelete. My cars are always red and it's great to see the fashion for wall-to-wall silver has been replaced by black, white and yes, even red paint jobs. It's about time our kit designers ditched black and realised there are other colours in the spectrum which make us more visable to motorists, as even Tour de France winners are not immune to problems with other road users. Talking of the Tour, it's fabulous that it comes through Yorkshire next year and in fact the route passes just 400m from my former home in Hebden Bridge. All the local hotels were booked up weeks ago and the spin offs for the area's economy are just immense, plus it will inspire folk to get out cycling which has to be good for health reasons - and bike manufacturers !